Grand Valley Region Citizens National Park reserves a special place of honor for the Fruita City Council. In this most recent effort to re-designate the Colorado National Monument a National Park, it was the Fruita City Council who led the way, as the first local municipality to issue a letter of support. We believe history will well remember their leadership and support of this historic effort. The road to national park status has almost never run smoothly, which may explain why over the past 100 plus years only 59 have achieved the coveted status of a national park. Behind many beloved U.S. national parks you will find the story of a man or community who worked tirelessly to gain Federal support, sometimes you will also find protagonists who worked equally hard publicly or privately to quash “America’s Best Idea” in their own community. Here in the Grand Valley the historic quest to designate our backyard canyons a national park has had many heroes . John Otto famously declared in 1907, “I came here last year and found these canyons and they feel like the heart of the world to me. I’m going to stay and build trails and promote this place, because it should be a national park.” The community overwhelmingly rallied behind Otto. Their unflagging support and the tireless leadership of Otto, The Daily Sentinel and at that time the Grand Junction Chamber of Commerce convinced President William Howard Taft, in 1911 to designate our canyons, the Colorado National Monument. Otto then spent the rest of his life writing letters and contacting legislators to elevate the monument to a national park. The Grand Junction Chamber of Commerce led a second failed attempt to triple the size of the Colorado National Monument and re-designate it a national park in the 1990’s. Then, two years ago a study group comprised of 18 locals was able to lay a series of questions to rest but disbanded without taking a position. 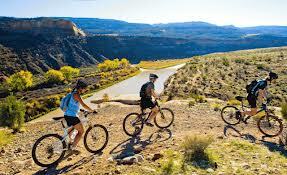 It was during that time (before the formation of Grand Valley Region Citizens for a National Park) that Fruita City officials looked at the available facts, agreed park status was the best thing for their community and issued an official letter in favor of re-designation. Their leadership should be noted. The National Park Service has closely evaluated the status of the Colorado National Monument and found it is among the very few which uniquely qualify for National Park Status. Moving forward, the municipalities, organizations, businesses and Grand Valley region citizens who have taken up where John Otto and an inspired community left off should also be remembered and honored for standing up, standing strong and leading the way. Nothing worthwhile ever comes easy.